We help hyper-growth companies develop their talent strategies and source the right executives to see those strategies through. With over 20 years of experience building global, hyper-growth organizations, Austin Cooke is a premiere HR leader. Austin has pioneered innovative talent programs, and his passion and expertise lies in building human resources infrastructures from the ground up. Under his mentorship, many HR alumni have gone on to hold executive leadership roles at prestigious companies. Valued as a C-level partner, global people strategist and executive coach, Austin’s experience includes designing HR and Talent strategies, defining culture and employment branding, developing world-class HR teams and recruiting top talent. Prior to co-founding Cooke & White Advisors, Austin was instrumental in scaling both Sapient and Vistaprint’s workforces to thousands of people worldwide. Most recently, as an HR leader for Vistaprint. As a thought-leader on talent and leadership, Austin has been featured in the Boston Globe, Forbes Magazine and ABC News. He recently served as an advisor to Gild.com and was an advisor to The Professional Aptitude Council, The Human Capital Institute, and Monster.com. Austin earned a B.S. degree from West Chester University of Pennsylvania and currently resides in North Carolina. Michael White is a talent acquisition innovator. After more than 20 years as a recruitment executive at globally recognized, multibillion-dollar organizations, Michael has developed a reputation for implementing visionary talent acquisition initiatives that align recruitment practices with strategic business goals. His passionate professionalism has enabled international, hyper-growth organizations to scale dramatically, leading to several billion-dollar acquisitions by heavyweights like Oracle and IBM. Michael’s talent for strategic transformation has been a defining feature of his career. Prior to co-founding Cooke & White Advisors, Michael spearheaded key talent acquisition initiatives for Iron Mountain, Endeca Technologies, Sapient, and Rational Software. In particular, his work led to a 30% increase in applicants and a 25% increase in recruiter productivity at Iron Mountain as their Vice President of Global Talent Acquisition. Michael sat on the advisory board for Monster.com and has presented at the MIT Executive Forum, educating early stage startup CEOs on recruitment best practices. He is a graduate of New Hampshire College and resides near Charlotte, NC. Patricia Lopez is an executive search superstar. She brings over a decade of expertise to recruiting directors, VPs, and C-level executives for various industries, including software, professional services, hospitality/tourism and retail. Prior to joining Cooke and White Advisors, Patricia worked with McIntyre Company, Fenwick Partners, Heidrick and Struggles, and Sapient. She’s helped hyper-growth companies improve and expand their executive recruiting functions—she even built an executive search function within Sapient when executive searches were mostly outsourced. Patricia brings her gregarious personality, collaborative mindset and exceptional work ethic to every client and search she undertakes. She is an effective communicator and is well-known for getting things done. Patricia earned her B.A. in Journalism from Indiana University and currently resides in Cincinnati, OH. When not searching for top talent, Patricia enjoys travel, reading and skiing as well as raising her family, which remains a work in progress. Andrew Gertig is a dynamic Talent Acquisition and People Operations leader that thrives on bringing top tier companies and people together. 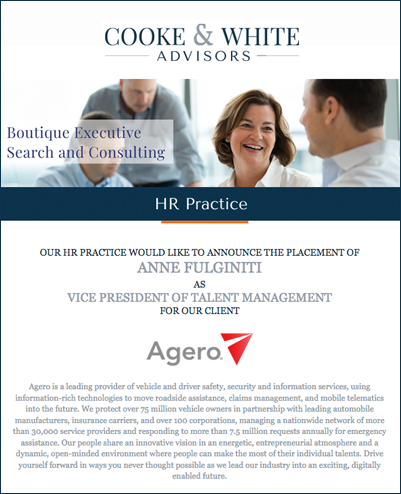 Prior to joining Cooke and White Advisors, Andrew, who began his career as a US Air Force Officer, spent several years in talent acquisition and as the Chief People Officer of a fast-growing technology consultancy. Andrew brings valuable, integrated skills from his time working as an operator, engineer, sales leader, and software product manager for leading technology companies. He also co-founded a technology startup called OtherScreen, where he led recruiting, team-building, and product management. Andrew values building professional relationships and he looks forward to helping clients and candidates find exceptional opportunities. Elsa Stanger is widely viewed as one of the best in the recruiting industry. She brings 20 years of executive search experience and has helped place well over 100 executives at some of the fastest growing companies in the world. Elsa has a longstanding professional relationship with Austin and Patricia, having worked with both for more than a decade at Sapient. Prior to Cooke and White Advisors, Elsa also worked with Johnson Smith and Knisely, and has worked with a number of other corporate clients, such as Vera Wang Online, Fannie Mae, Analog Devices and Navisite. Friendly and extremely hard-working, Elsa is highly valued by our clients and job candidates alike for her ability to make the recruiting process transparent, guiding both candidates and potential employers to a common understanding of the challenges and expectations in any hire. Elsa earned a B.A. degree from Wellesley College in Religion and Music and lives in Merion Station, PA.